It's worth noting perhaps that my career has been around privacy and security, and so this really flustered me. After years of loyal service, when I've already provided AirBnB with access to my home address, phone number, and social media accounts, they've taken it a step further and decided that wasn't enough. As the world retreats from American-hosted providers in a post-Snowden whisleblown world, I got an email from one of my favourite U.S. services, AirBnB. If you're not familiar, AirBnB allows you to rent out an extra room in your home, or your entire place, for one night or as long as you'd like. 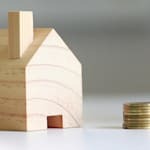 I read about it a few years ago, when an enterprising young woman in San Francisco claimed to make the equivalent of a salary from renting out her extra room. As I travel a lot, I realized this would be a great way to offset my mortgage costs, so I put it up right away. It took some time to realize what an appropriate price was in my area, and I discovered I get about $30/night less during the week than on weekends. This is generally a better alternative to Craigslist in my experience for several reasons: you can choose as long as you want at any given location, you can clearly define a unique policy, and you get amazing insurance coverage you couldn't get elsewhere. It wasn't until travelling with a partner a few years ago that I really started to use it to stay at the locations of other hosts. We got keys to our own furnished place in Manhattan for $80/night, when hotels are usually +$300/night in the area. This offering is so disruptive to businesses, New York City has since banned residential short-term stays that are less than 30 days. Years later, I'm writing this from a place I found on AirBnB, and my condo is rented out to an AirBnB guest. I've been perhaps AirBnB's greatest Canadian advocate, at least until now. I went to renew my stay at this cute little condo when I was told that AirBnB has partnered with some other American company, Jumio, and now required a copy of my government-issued identification. The biggest challenge is, once my government ID touches U.S. soil, it is bound by the U.S. Patriot Act, and many U.S. government agencies can have access to it. It's also an unacceptable risk to allow Jumio or any American third party provider, to hold my personal information, when they will likely be hacked. I contacted AirBnB and asked them to reconsider. They insisted that the transfer of one's government-issued ID to their new American partner was secure; and I responded that I didn't ask about that. I have no doubt the transfer of the information is relatively secure, that's exponentially easier than guaranteeing me that no American government agency will get access to my information on Jumio servers, or even that Jumio complies with Canadian privacy legislation. They responded again telling me that the transfer of the data is secure, and that if I had further questions I needed to contact Jumio. Why would I contact Jumio, an organization I have no business relationship with? Jumio may use the Personally-Identifying Information a user submits for any purposes related to Jumio's business, including, but not limited to providing you with Jumio's services and personalizing and improving those services for you. What? If selling my passport photo and information generates revenue for Jumio, that is an acceptable usage for them? There are several other obvious concerns. Basically, if Jumio feels like it, they can provide your information anyone they consider a partner or contractor. Best practice in Canadian privacy for businesses is not to request any more information than is required to complete the business transaction. Best practice for any non-American is to avoid sending personal information unencrypted over the Internet or to anywhere on American soil. 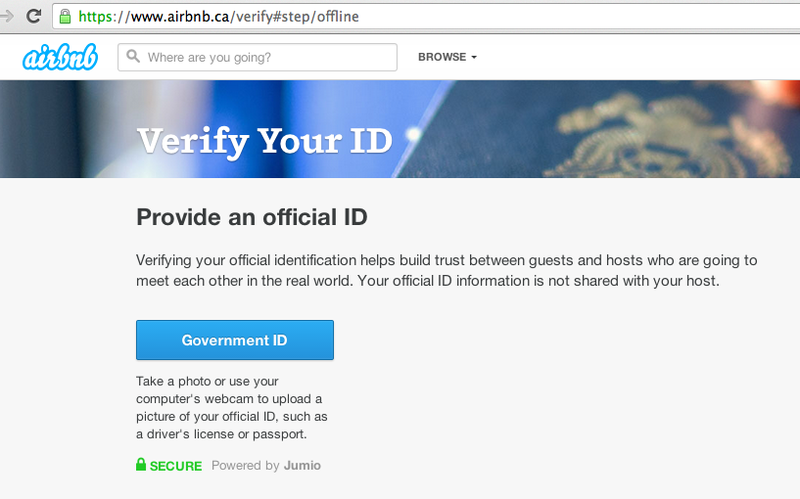 Best practice for privacy protecting users is to wait until AirBnB resolves this issue before submitting your government-issued ID. As for me? I worked out a deal with my AirBnB host as they respect my concerns, and I'm now staying here with a private, non-AirBnB contract. 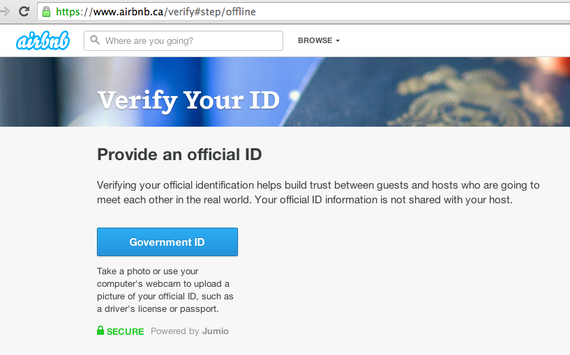 I wonder if a privacy respecting alternative will appear before AirBnB resolves this issue.